"In a sequence of thirty one sonnets celebrating famous Music Hall and Variety performers, Keith Hutson shows just how right Eliot was when arguing that Marie Lloyd represented and expressed ‘that part of the English nation which has perhaps the greatest vitality and interest’. From Lottie Collins’s Ta-ra-ra Boom-de-ay and Vesta Tilly’s Burlington Bertie to a saucily cross-dressing Anita Harris on The Good Old Days, Hutson lets us see why Goebbels wanted to execute all Music Hall entertainers. Humour lifts the veil on our prejudices and hypocrisies, at the level of genius in Shakespeare and Dickens, as glorious subversive entertainment brought back to life in these wonderful poems." "Knowing, funny, sad, virtuoso, these compelling sonnets bring theatrefuls of yesteryear vividly to life. Keith Hutson explores art as artfulness, performance as a way of coping, or seeming to. His ad-libs are perfectly timed and if we laugh out loud at his routines, we flinch too at the ‘imaginary hot fat’ of the risks his characters take by being centre-stage." "From Georgie Doonan kicking his own backside to Tubby Turner wrestling a deck-chair, this is a pamphlet guaranteed to leave the reader wanting more. What an array of music-hall stars Keith Hutson parades before us in these witty, beautifully handled sonnets. Master of quick-fire comedy, rather like the characters he brings back to life, this poet to watch gives us a ‘contortionist who couldn’t make ends meet’, a fryer of imaginary fish who ‘makes every spit and spatter count’, his younger self as ‘a chubster with a nan who made me laugh/like I was full of helium’. Like Reg Gardiner, Hutson leaves us ‘travelling to Variety, first class’. First class, indeed. I can’t wait to read his full collection." "These poems illuminate something timeless about ambition and the human spirit. Keith Hutson is a wonderful talent - his hardworking and technically-assured poems arrive all of a piece, centre stage." but too much oomph could suffocate his son. through Bertie she breathed I haven’t a shirt. than I’d ever required, or will again. together, but less polished, more fatigued. all to clear their throats, like this, a-hem! comes with Can everybody manage that? code. Rough interpretation: Kiss my arse. "Keith Hutson’s sonnets deserve a build-up because between them they provide loving, uncensorious, non-condescending, wonderfully vivid accounts of the lives and acts of artists whose names, like their performing skills and the halls were they put them into practice, are in danger of being forgotten. Still, in saying this I don’t mean to suggest that Routines is merely a tribute to the fallen. More importantly, it’s a celebration, including a celebration of the craft of poetry. Routines could justifiably carry as sub-title “A House of (sonnet) Varieties”, and one that more than re-pays the price of admission. Hutson displays a limber regard for, among others, the Petrarchan, Elizabethan and Miltonic sonnet forms, and he as adroitly handles the volta whether it occurs after six, eight or twelve lines; he even provides accomplished sonnets in tercets with a concluding couplet." "As a performer, Keith’s ability to hold an audience and thoroughly entertain them was something to be marvelled at. This was thematic to the poems and brought them to life by re-enacting much of the physical humour of those he writes about. Keith’s love of this form of entertainment emanated from his performance and the enthusiasm he applied to each story about the poems he read. It was very much as if he was talking about old friends no longer with him, and not strangers. They had touched Keith’s life enough to be the major influence in his poetry. The poems themselves were cleverly written and each of them took the audience back to a place where, what Keith called “gentle northern laughter” was the popular choice of the day, for towns and cities everywhere. Keith’s delivery gave the younger people present an introduction to those whom history doesn’t seem to remember. It was Keith who brought them back to life, and celebrated their lives among friends. Consequently, the small room became a mini-music hall itself, and the notes and melodies were the raucous peals of laughter Keith invited, that amplified the atmosphere. With so much talent present, and such a love of poetry itself on display, this was a brilliant night, with Keith on top form." "Keith's act was [...] engaging, moving, and witty. [...] it most certainly left us wanting more, more, more." "His 31 sonnets in Routines are laugh-out-loud funny while somehow not forgetting the hard lives of the performers and the endless routine of their acts. Published in the understated plain livery of the wondrous Poetry Salzburg you couldn’t begin to guess what lies inside. […] If you get a chance to hear Keith read, then don’t hesitate. Drop everything and go. And get yourself a copy of Routines for your own stocking as well as someone else’s." "Hutson comperes a bill for us that spans the early nineteenth century to the age of television yet he is always present in the middle of a row, backstage or in a dressing room after the turn. His delivery is understated, he doesn’t self-consciously poeticise; the sonnets are aptly unassuming in contrast to the vulgarity of some of the acts. He is talking to us in a snug, somewhere in the north and whilst his language is plain there are no flat lines, everything is gently heightened, nudged towards iambic pentameter or even its ghost. [...] Routines is an achievement. It has charm and wit, is beautifully presented by Salzburg and I suspect, quite a warm-up act for even better things to come." "The fantastically lavish and unusual stars who glitter, pirouette and stumble through this hilarious, affectionate collection, all clearly made a deep impact on the young Keith Hutson who, his years as a script-writer for Les Dawson and Coronation Street still decades away, either heard about or actually saw their performances for himself, such as in Burlington Bertie, when he recalls the tradition of male-impersonators and remembers seeing the song on television. [...] It is worth noting that Keith Hutson is himself a talented performer, and it has been exciting to see him delivering these super slices of theatrical nostalgia in the flesh." "I am a big admiring fan of Keith Hutson." 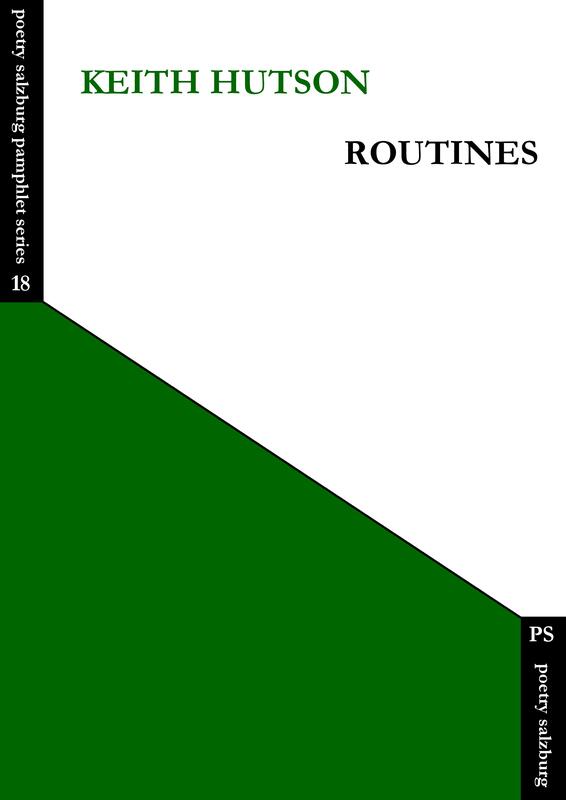 "Routines is the variety show of variety shows ... an achievement of no little dexterity and skill, both formally and thematically. Hutson's undoubted talent for wordplay and humour is ideally suited to the world of variety shows and his love for his subject radiates from the page. However, the pamphlet's greatest strength is the way Hutson marries on-stage lightness with its underlying dark side. Ta-ra-ra Boom-de-ay indeed!" Georgi Gill. "Review". The Interpreter's House 65 (October 2017): 119. "Hutson’s knowledge of the freaky world of variety acts is exhaustive, from Burlington Bertie to George Gorin and his Pedalling Princesses. But besides the bizarre nature of much of this material [...] Hutson is a maker, an assured poet sprung fully formed on us, to any poetry lover’s delighted surprise. He has a wonderful touch when it comes to comedy, [...] but he has a deep knowledge of the history of these acts that inspire him, and a deft sense of rhyme as well, and there is a musicality in these flexibly formal sonnets that adds terrific charm to the amusement." Anthony Howell. "Sonnets for All Tastes". The Fortnightly Review (November 2017).